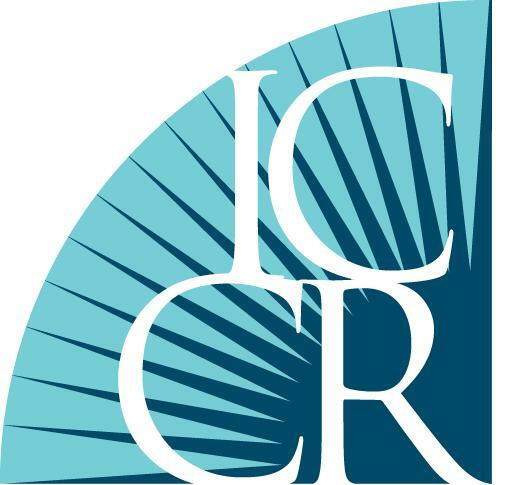 The Interfaith Center on Corporate Responsibility, a coalition of institutional investors representing $200 billion in invested capital that engage corporations on the environmental and social impacts of their operations, sent a letter yesterday to all U.S. Senators urging them not to pass the Financial CHOICE Act. There is an intriguing place where we might begin the work of a renewed economic populism: in corporations, not the capital. If the goal of populism is the amelioration of life for the many, then President Obama could strike a confounding (in a good way) pose by calling on the private sector to take up an idea put forward this week by Fareed Zakaria: unleash a corporate stimulus. “The Federal Reserve recently reported that America’s 500 largest nonfinancial companies have accumulated an astonishing $1.8 trillion of cash on their balance sheets,” Fareed writes. “By any calculation (for example, as a percentage of assets), this is higher than it has been in almost half a century. 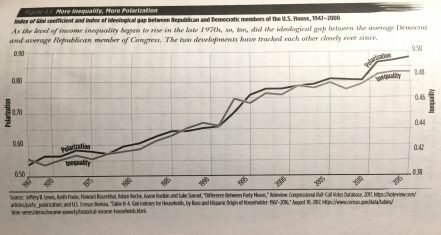 And yet, most corporations are not spending this money on new plants, equipment, or workers…[Such] investments would likely have greater effect and staying power than a government stimulus.” A populism that begins in the boardroom—that would really be change we could believe in. (The Right Kind of American Populism and Obama’s CEO Problem, Newsweek, 7/12/10). I’m not sure Obama has the power to get the private sector to start spending. Congress certainly didn’t do a good job of tying bank bailouts to bank loans. However, I certainly agree with Jon Meacham and Fareed Zakaria, populism could begin in the boardroom. Imagine a political system in which the incumbents get to select all election candidates, and voters have no choice but to vote for these nominees, or not vote at all. Such “democracy” rules the US proxy process by which investors elect corporate board members. Now, an “open ballot” movement among big shareholders is working to shake up how boards are elected. The Magna Carta was drafted in response to the excessive use of royal power, while the move for proxy access stems from the abuse of power by management at Enron, WorldCom, Tyco and others. The first clause of the Magna Carta guarantees “freedom of elections” to clerical offices of the English church to prevent the king from making appointments and siphoning off church revenues. A shareholder’s Magna Carta would prevent managers from having undue influence over corporate boards and will prevent them from using corporate coffers as their personal bank accounts. Think markets and proxy contest are the answer? Who has enough to buy BP? Even after much of the wealth has been destroyed, the takeover and transition of poorly governed corporations back to profitability is also expensive, generally estimated to range between two to four percent of the value of the firm. There may be very heavy transaction costs for employees through layoffs, lost wages, increased divorce and suicide rates, as well as to communities in the form of lost taxes and charitable contributions. In contrast, the cost of proxy driven changeovers have run considerably below one percent. In August of 1977, the Business Roundtable recommended “amendments to Rule 14a-8 that would permit shareholders to propose amendments to corporate bylaws, which would provide for shareholder nominations of candidates for election to boards of directors.” Their memo noted such amendments “would do no more than allow the establishment of machinery to enable shareholders to exercise rights acknowledged to exist under state law.” Now the BRT seems to think proxy access will be the end of the world. In “Toward Democratic Board Elections,” published by The Corporate Board (7-8/2003) I noted, “After years of allowing shareholder proposals concerning elections, the SEC in 1990 issued a series of no-action letters ruling that proposals concerning board nominations could be excluded. Proposals by institutional investors were beginning to win majority votes. Perhaps the SEC realized failing to issue no-action letters could soon have consequences.” The court in AFSCME V. AIG came to the same realization three years later. Competition for board positions has traditionally stimulated share value. Researchers have found that firms with stronger shareholder rights had higher firm value, higher profits, higher sales growth, lower capital expenditures, and fewer corporate acquisitions. Investors who bought firms with the strongest democratic rights and sold those with the weakest rights would have earned abnormal returns of 8.5 percent per year during a sample period. It is paradoxical that the standard justification for autocratic practices in industry is its alleged efficiency, since empirical research results do not support that conclusion. Increased rank-and-file responsibility, increased participation in decision-making and increased individual autonomy are all associated with greater personal involvement and productive results. The keys to creating wealth and maintaining a free society lie primarily in the same direction. Both require that broad-based systems of accountability be built into the governance structures of corporations themselves. By accepting the responsibilities that come with ownership, pension funds and other institutional investors have the potential to act as important mediators between the individual and the modem corporation. Indeed, populism that begins at the boardroom could change populists could believe in. First, a precautionary note about this post. These are strictly my impressions. There is no intention here to present juicy findings with regard to any corporation, fund, individual etc. My purpose is simply to help facilitate dialogue and understanding. Keep this in mind as you read my notes, as well as the following. One of the panelists from a government agency began with the standard disclaimers about how what he said was his opinion alone and did not necessarily reflect the views of his agency. 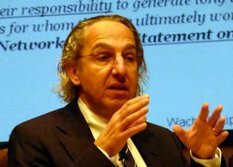 Ted Mirvis, a partner with Wachtell, Lipton, Rosen & Katz interrupted, as I recall, saying something to the effect that he not only disavows the applicability of any of his statements to his firm, he also disavows their applicability to himself. That got a laugh, but says it all. The conference was the perfect venue for throwing out ideas and seeing what sticks… what resonates with those attending. We can learn a lot from that. Of course, there were also plenty of hard facts. Your comments and especially your corrections are welcome. To comment directly on the blog, you’ll need to register first. Just press the “No comments” button and it wil step you through registration, if you aren’t already registered. (This process cuts down on spam.) If you don’t want to bother registering, you can always e-mail your comments directly to [email protected]. Your feedback on my coverage, the topics and the conference itself are important to me. Prior to the dinner, there was a networking reception held outside the Joan B. Kroc Institute for Peace & Justice… a wonderful facility in a beautiful setting overlooking the northern part of San Diego. My little point and shoot camera can’t do the place justice. I’m sure the Forum will have much better photos on their site, perhaps on the Conference Materials page where you will find a wealth of studies, books and other resources. Keynote: The Honorable Leo E. Strine, Jr., vice chancellor, Delaware Court of Chancery. 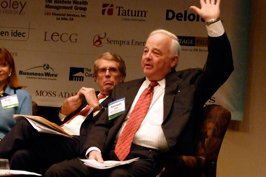 At the dinner to kick off Directors Forum 2010, Strine’s main point seemed to be that we can’t expect corporations to act in the long-term interest of shareowners if most investors are rewarding short-term performance. He looks at corporations as republics, rather than direct democracies. Regarding proxy access, he appears to favor the opt-in option to encourage innovation without imposing a government mandate. Shareowners who propose changes should have long-term holdings, whereas most activists hold only a short time. They should have a substantial positive interest and disclosure should be required so we know they aren’t shorting. Adolph Berle discussed separation of ownership from management and control but now we have separation of ownership from ownership. Too many fund managers are looking out for their own interests, rather than those of beneficial owners. Hedge funds are turning over their shares three times a year. Active mutual funds are holding only for a year on average. At the NYSE turnover was 130% in 2008 and 250% in 2009. Owning Intel 14 times in 10 years isn’t being a long-term owner by Strine’s measure. Institutional investors have been too little concerned with risk management and utilizing leverage. Too many are focused on getting rid of takeover defenses, stock buy-backs and replacing CEOs who don’t yield the highest short-term returns. We’ve been driven to the point that 280 out of the S&P 500 spent more on stock buy-backs than on investments. Pricing and tax to discourage short-termism. Build fundamental risk analysis into corporate governance measures. Compensation of investment managers based on the horizons of beneficiaries and beneficial owners. 401(k) and college plans consistent with those time horizons. Fixing the definition of “sophisticated investors.” Many trustees are sophisticated investors and shouldn’t be able to take their funds into unregulated pools. If pools dry up, that may lead hedge funds to disclose, since they need that capital. We need to know more about hedge funds – your positions, your voting policies, etc. Investors should focus less on leverage and gimmicks, more on real cash flow and perfecting business strategies. Let’s get away from checklist proposals. See also Overcoming Short-termism: A Call for a More Responsible Approach to Investment and Business Management, The Aspen Institute. Also of note is Governance at Fortune’s 100 Best Companies to Work For, The Corporate Library Blog, 2/5/10. Most of the companies which excel in the employee satisfaction are privately held. Among those that are public, company founders or families have a disproportionate ownership stake. These firms feel less pressure to meet quarterly expectations and can take more of a long-term perspective. Welcome & Introductions from Linda Sweeney, executive director, Corporate Directors Forum; Larry Stambaugh, conference program chairman, Corporate Directors Forum. I must say, Linda, Larry, Cyndi Richson and Jim Hale have built this conference into a premier event. 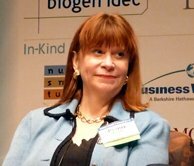 Moderator Cynthia L. Richson, president, Richson Consulting Group; former member, PCAOB Standing Advisory Group, former head of corporate governance, OPERS & SWIB. Panelists – Patrick S. McGurn, special counsel, RiskMetrics Group , ISS Governance Services; Jennifer Salopek, chairman, Charlotte Russe Holding, Inc. principal, ARC Business Advisors LLC; Andrew E. Shapiro, president, Lawndale Capital Management, LLC; John Wilson, director, Corporate Governance, TIAA-CREF. Again, there was some focus by panel members of long-term vs. short. Are compliance driven measures and the use of compensation consultants driving oversized compensation? Some seem concerned that directors are more focused on compliance and in developing a plan that can be explained than they are in coming up with the best package. Also of concern, last year’s rally may lead to out-sized awards implemented last March or April. As several others at the conference also pointed out, options are a vestige of the tax system… better to see restricted stock granted as performance targets are met. The feeling expressed by many is that the tax system shouldn’t be driving the form of C-Suite pay. There is also a tendency by a shareowner elite to focus on exit that leads many companies to underinvest in strategy, R&D, and management systems. 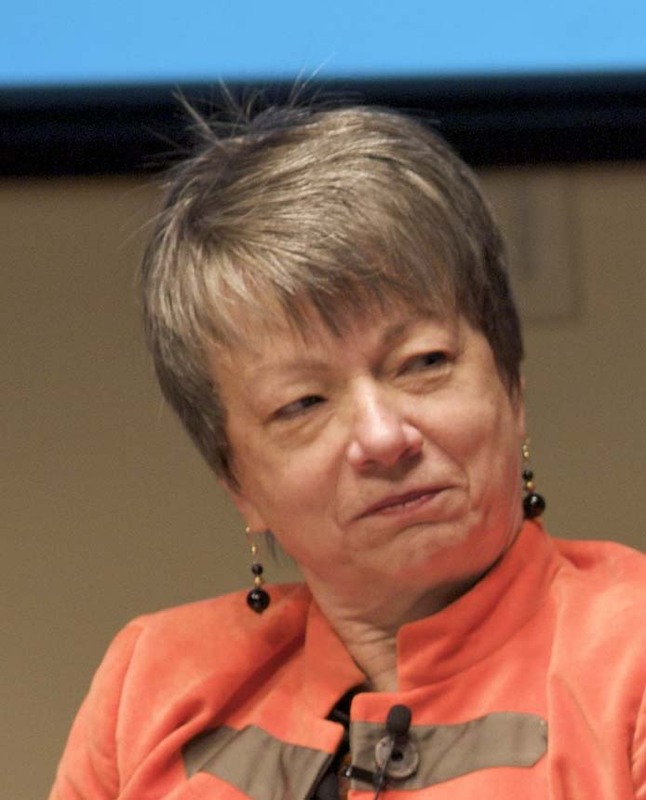 Shapiro sees a wave of management led buyouts on the horizon as well as activism by creditors to address over leveraged balance sheets and liquidity problems. He is buying up debt that can be converted to equity… reamortizing balance sheets. He expects this to continue for several years because of limited economic growth. Management is likely to see the light at the end of the tunnel first and will use that advanced knowledge to look for private buyout opportunities. He sees too many no-shop clauses, rights of first refusal and other deal protectors that give a control premium to management. In these situations, independent directors should seek real competition through an auction. John Wilson was asked about how proxy access would be impacting TIAA-CREF. He responded that ideally they will have access rights and never use them. Just having that power should lead to more dialogue between shareowners and companies. They will look at each situation individually and may side with as access filer or management. Pat McGurn said these types of contests will be management’s to lose, not to win. RiskMetrics will need to be convinced of the need for change. It will be something of a last resort, like just vote no campaigns. Many are likely to settle out before proxies are finalized, either through trade-offs or board enlargement. He also noted that out of 12,000 board candidates up for election last year, fewer than 100 didn’t get elected. Many such contests are coming at companies that don’t have majority vote requirements. Shapiro and others pointed out the real impact of proxy access may be overblown, since not much will be saved by having a universal proxy card. Challengers will still need to campaign and that costs money. Additionally, many hedge funds won’t use it because of the change-in-control exclusion. 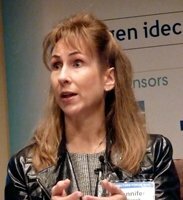 Asked about liquidity, Wilson said at TIAA-CREF it is driven more by economic conditions than any growing net-flow of baby boomers out of the workplace. Companies should see long-term shareowners as their allies, not those who acquire rights just before the proxy vote. Again, emphasized the need for constant communication. Salopek said one of the advantages she has found in having a split chair is increased dialogue with shareowners. Shareowners find it more difficult to talk about concerns, such as about CEO pay, when the CEO is also the chair. 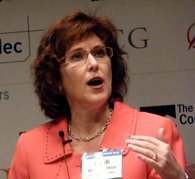 Another panelist cited a university of Santa Cruz study that showed even one woman director on a corporate board led to greater board independence and better financial reports. (sorry, I did a quick search but didn’t find the study) That led to discussion around diversity and the need to apply thinking more broadly. I know that CalPERS and CalSTRS are working to build a pool of potential candidates for proxy access nominations. Diversity will play a large part in developing the list. Wilson’s final advice included papering in a day or two of engagement for directors with shareowners before the meeting. Shapiro similarly recommended calling your top 10 shareowners to hear their concerns… actually check in with several types. Keyword for the panel — communication. Further reading: Activist Shareholder Dialogue, Andrew Shapiro. Moderator The Honorable Leo E. Strine, Jr., vice chancellor, Delaware Court of Chancery. Panelists – Theodore N. Mirvis, partner, Wachtell, Lipton, Rosen & Katz; Brandon J. Rees, deputy director, office of investment, AFL-CIO; Lynn A. Stout, professor, Corporate and Securities Law, University of California, Los Angeles School of Law; Lynn Turner, managing director, LECG; former chief accountant, SEC; trustee, AARP, Colorado PERA. We were reminded that individuals still own about a third of all shares, mutual funds and ETFs are the next largest holders with pensions coming in third with about 20%. Turnover by all seems to be going through the roof. While it was about 150% in the early 2000s, it accelerated to 200% and last year 300%. Among the most pressing issues this season for labor are “say on pay” and proxy access. Compensation plans aligned with long-term interests and holding. Restricted stock awards should be held for five years and preferably beyond retirement. When chasing return and trying to beat the market, active managers are likely to be little concerned with corporate governance or proxy issues. Yet, ideally these should factor into investment decisions. Labor would like to see reforms in the tax code and a very small transaction tax to discourage turnover. Turner was largely in agreement with Rees up until that transaction tax. He sees the need for tax reforms, greater transparency and much more dialogue, as well as a heightened fiduciary duty that would include better disclosure of conflicts of interest. All funds should have to disclose votes and policies. He also sees too many funds voting for poorly performing corporate directors. As I heard this last point, I couldn’t help thinking, “Yes, but how do we know which are the poorly performing directors?” Maybe the new disclosures required by the SEC will begin to give clues. 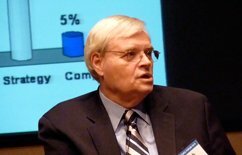 Ted Mervis noted a 2003 Conference Board report that investment funds shouldn’t compensate on a quarterly basis. Yet, that isn’t likely, because funds with the highest returns this year attract the most capital next year… even if there is no correlation in the performance for both years. Perhaps sharowner democracy amounts to “faith-based” corporate governance, since there is so little evidence that shareoweners are really in it for the long-term. There was some mention that corporations are more likely to talk to activist funds than indexed funds, even though they are less permanent shareowners. I presume this is because activist funds are more likely to spend time and money analyzing the issues, whereas indexed funds, wanting to minimize expenses, may do less. Stout said there is decades of evidence that trading eats up about 1.5% of return each year. The greater the sharowner power, the higher the issuers turnover. 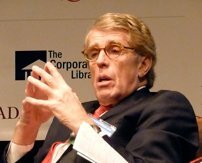 Rees said he supported indexing, long-term investing, defined benefit plans, disclosure of proxy voting and a reassessment of securities lending practices and rules. Mervis thinks too many directors may be knowing each other “by name tags” because of increased turnover and less collegiality. Strine seemed to put forth the idea that shareowner rights aren’t inherently good. In fact, maybe we should embrace shareowner ignorance. Increasing leverage to chase returns can lead to ruin. He agreed with Stout, we need higher fiduciary standards for investors. 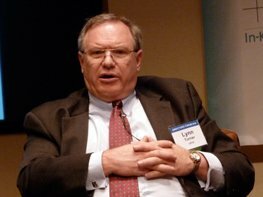 Stout seemed disposed to a small transaction tax and thought ERISA standards are needed to limit what funds can invest in. It is also time that companies looked at adopting bylaws limiting those who can file bylaw proposals to those without certain conflicts and derivative positions… maybe shareowners should have to hold for two years. That got a lot of attention from directors in the audience who virtually swarmed Stout at the panel’s conclusion. 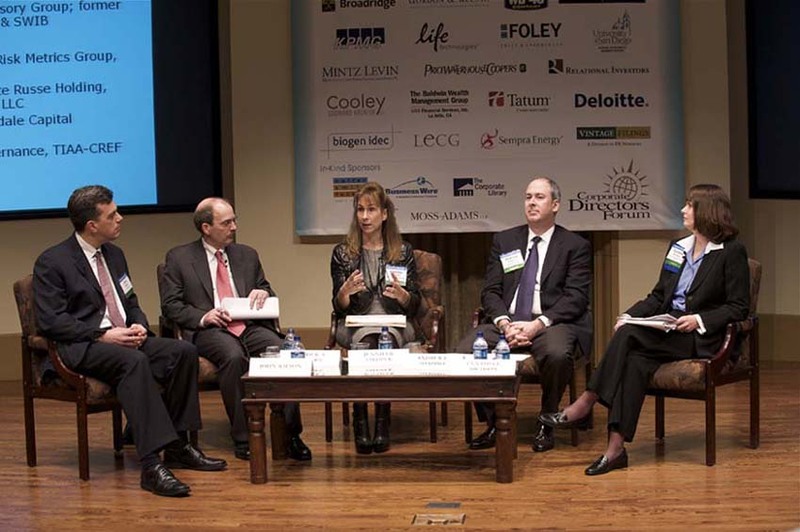 For further reading see The Mythical Benefits of Shareholder Control (Stout, 2007) Fiduciary Duties for Activist Shareholders (Iman Anabtawi & Lynn Stout, 10 April 2009) Find more reading from several of the panelists on the Conference Materials page. Personally, Lynn Stout is one of my favorites. I don’t always agree with her conclusions, but she is certainly a creative and stimulating thinker. 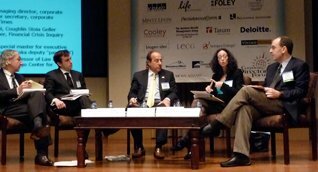 Moderator Theodore N. Mirvis, partner, Wachtell, Lipton, Rosen & Katz. Panelists Rhonda L. Brauer, senior managing director, corporate governance, Georgeson; Byron S. Georgiou, of counsel, Coughlin Stoia Geller Rudman & Robbins LLP, Financial Crisis Inquiry Commission member; Robert Jackson, Jr., deputy special master for executive compensation, Department of the Treasury (aka deputy “pay czar”); Frank Partnoy, George E. Barrett Professor of Law and Finance; director, University of San Diego Center for Corporate and Securities Law. 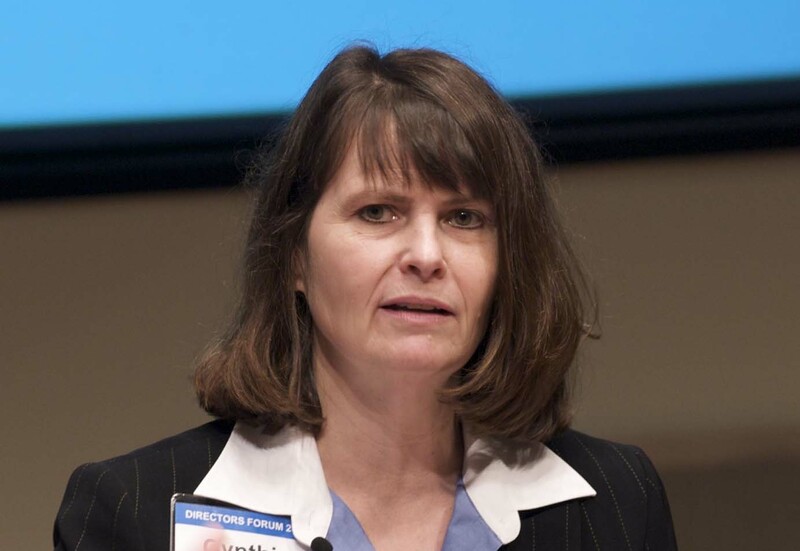 Mervis went over the pending proxy access proposal and discussed legislative push for separating board chair and CEO, push against staggered boards, mandatory risk management committees and enhanced disclosures. Some boards are getting ahead of the ball by passing their own measures granting shareowners a say on pay but limiting it to every three years. 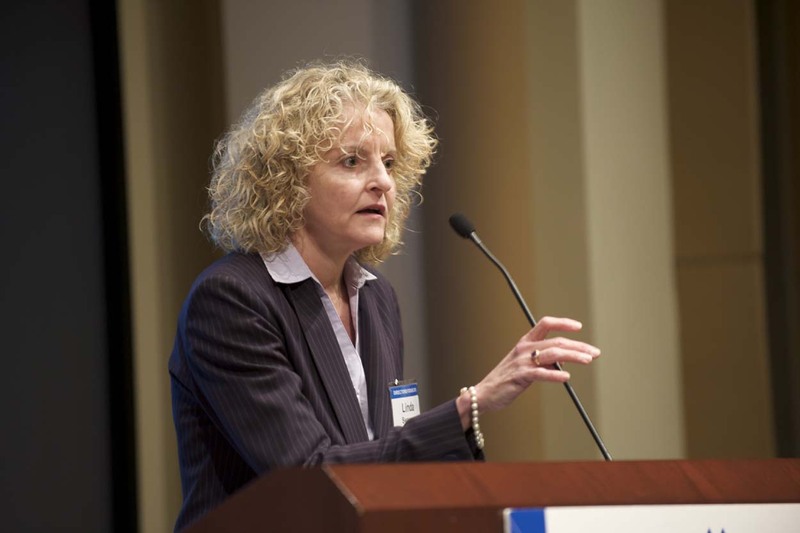 Brauer advised boards to be ready with their own proxy access proposals. What alternative does your board want if given and opt out option. Be ready for that possibility and check with your shareowners first. Jackson advised to look at how your compensation policies might be incentivising risk. Have a discussion before the fact with your shareowners and disclose the process you use to think about risk. Too many financial intermediaries are making decisions that extend over years but are paying bonuses based on only yearly returns. Partnoy thinks reviewing a “worst case” scenario might be a useful exercise for most companies in developing a risk profile. Partnoy expressed his desire to see financial institutions treated differently. 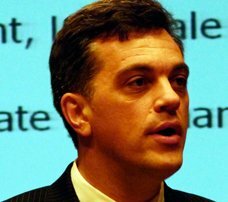 Georgiou noted the Financial Crisis Inquiry Commission got an enormous volume of google searches during its first hearing. Regulators can’t keep up with innovation and need market mechanisms to enforce behavior. One key reform might be a requirement to have underwriters hold a portion of the securities they create. They should be required to eat their own cooking, maybe also institute clawback provisions for their earnings. Capitalized gains and socialized losses doesn’t work. The issuer paid model is faulty. Even CEOs recently asserted no one should be too big to fail. Discussion around a resolution authority to take down such companies without risk to the larger economy. Problems at seven or eight firms shouldn’t be allowed to infect the whole system. 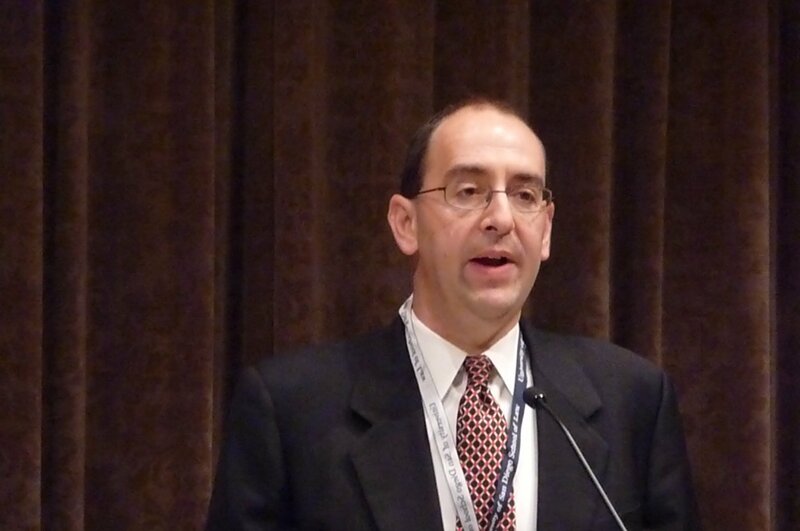 Further reading, see Frank Partnoy’s posts on the Huffington Post and the Conference Materials page. 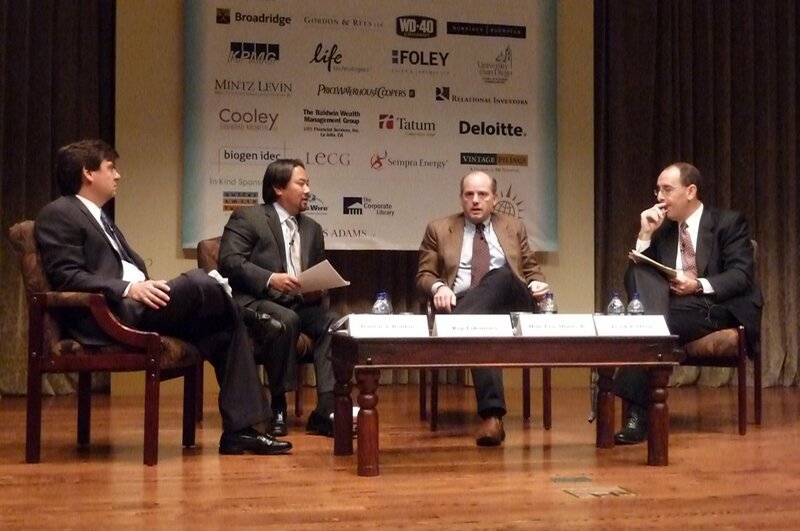 Lunch Panel: Bad Loans, Gatekeepers and Regulators – Is change on the Horizon or just a Mirage? 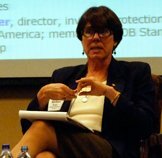 Moderator Lynn Turner, managing director, LECG, former chief accountant, SEC; trustee, AARP, Colorado PERA. Panelists – Charles Bowsher, former Comptroller General of the United States & Head of the GAO, director, the Financial Industry Regulatory Authority (FINRA); Kristen Jaconi, former senior policy advisor, for Domestic Finance, US Department of Treasury, former senior counsel to Michael Oxley, US House of Representatives; Barbara Roper, director, investor protection, Consumer Federation of America, member, PCAOB Standing Advisory Group. Bowsher sees at least part of the problem stemming from traders getting essential control of several banks, like at Enron. Safe and sound banking is important to reestablish. Favors a risk regulator with real stature but is worried that legislation that is 1700 pages long fails to focus. Roper sees the idea of an individual systemic risk regulator as a reform in name only, since they wouldn’t have the tools to do the job. They need to have the staff, tools and the authority, otherwise reform will be a mirage. See her testimony to Congress here. What we need, if anything is to be accomplished, is a fundamental shift in how we see regulation. Jaconi says we aren’t thinking big enough. The center of arbitrage is London, not New York. We need to be thinking on the scale of the IMF. Another point she emphasized was the importance of inspections and examinations. Training inspection staff will be critical but there is little notion of that in current proposals. The consensus of the group seemed to lean in the direction of mostly mirage with some substantive reform. The public has embraced say on pay but watered down derivative regulations appear likely to mostly miss the mark. Plenary Session: Risk Management: Monitoring for Known and Unknown Risks Moderator James Hale, former EVP, general counsel & corporate secretary, Target Corp.; director, The Tennant Company. Panelists Heidi M. Hoard Wilson, VP, general counsel & corporate secretary, The Tennant Company; Stephen A. Karnas, director, Mars, Incorporated; Lynn Turner, managing director, LECG; former chief accountant, SEC; trustee, AARP, Colorado PERA. Wilson discussed their extensive process at Tennant, from weekly meetings, board involvement, measuring probability and potential costs, disaster recovery plans, their ranking process, supply chains, etc. 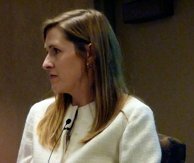 She discussed the need to pay special attention to sole source suppliers. You need to know who to turn to if they go bankrupt. Karnas described his experience at Mars and their use of a chief risk officer primarily functioning as facilitator. Their process is top down as well as bottom up, a little different than that of their recent acquisition, Wrigley, which views risk primarily from a centralized perspective. He discussed how each work and how they are likely to be integrated. Interestingly, the Mars board gets very involved, apparently traveling on a bus, during quarterly Board weeks, to their factories so they can view the production process and operations and become very familiar with risk at the core business level. Turner discussed his approach as one of finding out keeps them up at night. Ask your external auditor what are the top five risk areas at your company and at the competition. Ask the executives the same and note differences. What are the key trends in marketing, spending rates… key dashboard issues. How do you get to know risks that don’t get communicated? He stressed the need for a bottom up process, as well as top down. The consensus of the group was that risk is an issue that should be addressed by the full board, not shuffled off to an individual committee… although it may be important for the board to get input from multiple committees. Further reading: see Risk Management and the Board of Directors, Wachtell, Lipton, Rosen & Katz, 2009; Managing Corporate Risk, BoardMember.com; and Risk roundup 2010, McKinseyQuarterly.com. 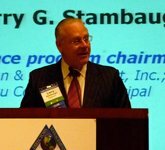 Moderator Larry Stambaugh, chairman & CEO, Cryoport, Inc., principal, Apercu Consulting. 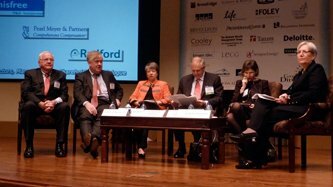 Panelists – James Hale, former EVP, general counsel & corporate secretary, Target Corp., director, The Tennant Company; Garry Ridge, president & CEO, WD-40 Company; Anne Sheehan, Director of Corporate Governance at CalSTRS; Matthew T. Stinner, senior managing director, Pearl Meyer & Partners. This was an interesting play-like exercise that was so much fun, I failed to take notes. However, I do recall the pretend CEO using that famous line, “It depends on what the meaning of the word ‘is’ is,” in response to a question from the compensation committee. It was a good discussion of the factors of what goes into pay for performance and the importance of what gets left out that isn’t recognized until after the fact. Key points: Most companies don’t factor in consideration of performance relative to peers or even the market… and they probably should. Plans should be simple and easily understood but driving compensation based on a single metric, like net income, probably results in too narrow of a focus. Payouts should be held for 3-5 years to emphasize longer term thinking. 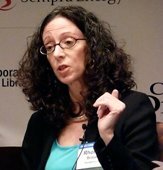 Further reading: Compensation Committee topics on BoardMember.com and Compensation Season 2010 (Wachtell, Lipton, Rosen and Katz)(PDF). 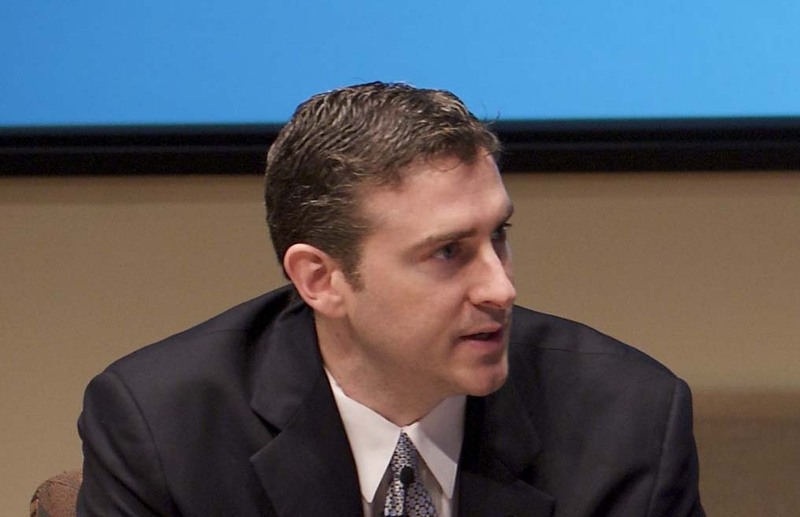 Castellani asserted there is a cultural divide between public thinking reflected by Congress and that of business leaders that is not unlike the divide between C.P. Snow’s scientists and nonscientists. The public wants many thing from business: high quality, employment, good stewardship, earnings, shared sacrifice. They see little difference between finance and other sectors… lumping all large businesses together. Board attention is generally more concentrated on good earnings and stock performance. Congress suffers from ignorance regarding how businesses work. They think boards are constituent based. They think boards operate like Congress does. The prevailing view is that directors are rubber stamps of CEOs. Yet, the truth is that CEOs are practically an endangered species (my term, not his)… going from a tenure of 8 1/2 years in 2006 to 4.1. He sees most of the reforms like “say on pay” and separating CEO and chair positions as a “relief valve” for American frustration with bigness and fears there will be unintended consequences. We need to help politicians understand how businesses work. He noted that the costs and performance of the U.S. health care system have put America’s companies and workers at a significant competitive disadvantage in the global marketplace. (see Business Roundtable Health Care Value Comparability Study) People hate insurance companies and banks. They are looking for shared sacrifice. 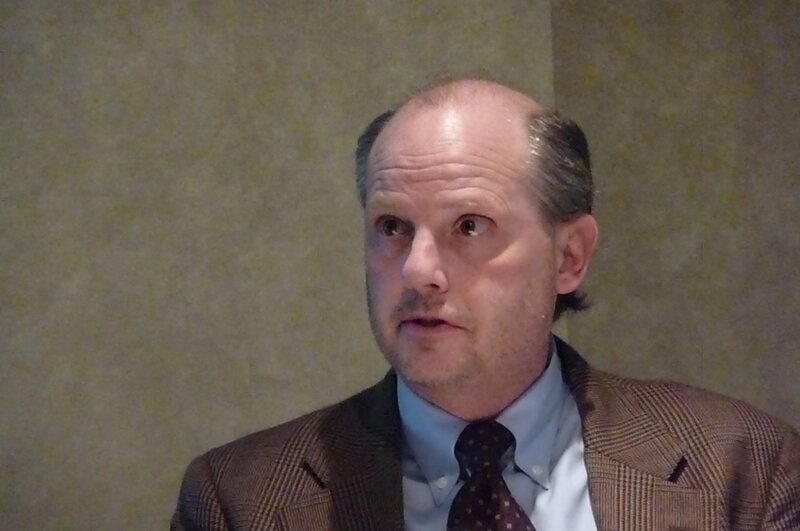 For further reading: John J. Castellani’s blog entries on the Huffington Post. 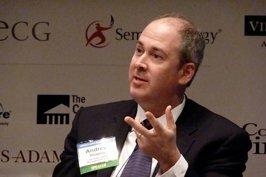 One discussion during the session was the problem that during a proxy fight, particularly in a three card proxy fight, shareowners can split their vote between cards, picking the best directors from each advocate. However, that opinion was not universal. The opposing viewpoint was that slates are good because they are more likely to result in an integrated board and directors with complimentary vetted skills. Things generally go worse when the company refuses to talk. Earlier is better. RiskMetrics doesn’t seek to review a strategic plan from dissident slates unless they are seeking a change of control. Most dissident groups are giving more thought to their director candidates these days… no longer mostly relatives. Hire a good proxy solicitor. Review corporate governance practices and consider eliminating those that are unpopular with media, like shareholder rights plans (poison pills). If you are going to make changes, do it before the contest. Identify possible conflicts of interest all around. Don’t retain CEOs on the board after they leave. Pay close attention to board skill sets and succession planning. Learn what shareowners are thinking. Dissidents shouldn’t assume they’ll get the votes if the stock price tumbles. Plenary Session: What is the Director’s Job Today, and How Does He or She Prepare for It? 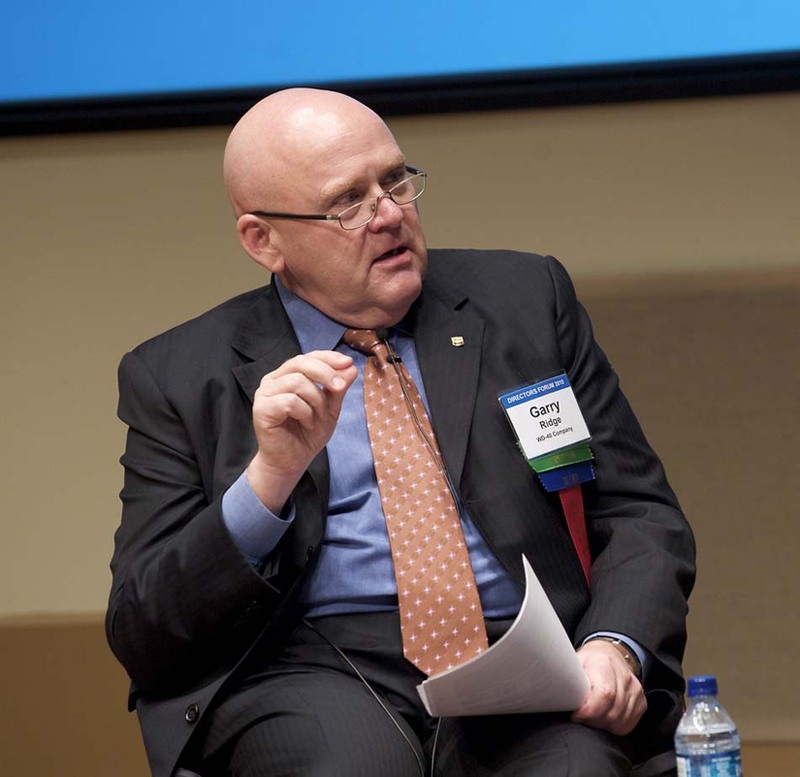 Moderator Kenneth Daly, president & CEO, National Association of Corporate Directors. Panelists – John T. Dillon, director, Caterpillar, Inc., Kellogg, Company, DuPont; Matthew M. Orsagh, director, Capital Markets Policy, CFA Institute Centre for Financial Market Integrity; Margaret M. Foran, VP, chief governance officer & secretary, Prudential; Richard H. Koppes, director, Valeant Pharmaceuticals International, former general counsel, CalPERS. One interesting finding from a recent survey was that board members are less happy with agendas than CEO/Chairmen. Strategy is top priority for boards in the coming year. 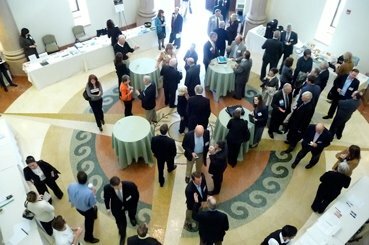 Interestingly, the conference made use of their ability to rapidly survey those in attendance regarding various topics. We simply pressed numbers on a little remote control type gadget and in seconds they displayed the results. This worked smoothly until this panel where there was one glitch. 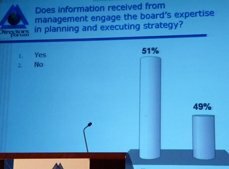 Asked if information received from management engages the board’s expertise in planning and executing strategy, the graph makes board members seem a little more satisfied than they really are, since there isn’t much difference between 51% and 49%. Boards want to discuss strategy before it is fully baked; strategy is job #1. Directors shouldn’t play the role of gotcha. Trust and respect are essential to board functioning. Dissent should be accepted. IT expertise and succession planning deficient on many boards. Balancing long and short-term strategies is key… see Aspen Principles. Put something in your proxy regarding succession planning. Further reading: The New and Emerging Fiduciary Duties of Corporate Directors by Elizabeth B. Burnett and Elizabeth Gomperz. 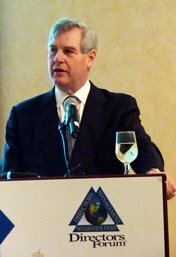 Keynote Speaker: William A. Ackman, founder and managing partner, Pershing Square Capital Management LP. Apparently, Ackman was on a recent edition of Charlie Rose, so Frank Partnoy couldn’t resist beginning the interview as if he were Charlie Rose. With all the talk about the need for long-term holders, that was one of the first questions. Pershing Square typically holds for about 2.5 – 3 years. 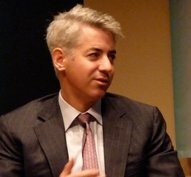 Ackman described his process, which mostly involves picking stocks that are undervalued (spread between price and value) and then he works on a strategy to get the market to recognize that value. He described his efforts at Wendys, which owned Tim Hortons. The chains weren’t really a great fit because of differences in how they operate and management styles, so he worked to get Hortons spun off… yielding a hefty profit. 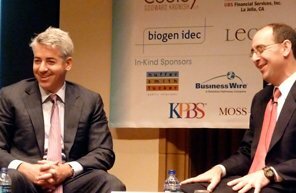 Ackman believes competition for board seats will give us better candidates and will cause boards to do more self-examination. Choice will force board to adopt term limits to keep fresh. He says boards should invite their largest holders and short-sellers to discuss any issues or concerns they may have. Try your best to understand your harshest critics. You’ll probably learn something. Asked how he’d do that, he suggested issuing a press release inviting the company’s biggest critics to call in and schedule a confidential meeting. Another case he discussed extensively was Borders, which he believes had been consistently mismanaged and is now finally facing a possible turnaround, even though the CEO that helped them regrow the company had just resigned the night before for a better offer… with no warning. One factor that appears to keep him invested for a longer term is reputation. If he bails out too quickly with a loss, his reputation suffers more than if he keeps a company for longer but ends up making something. Where’s the next crisis? Akman thinks it is likely to be failed municipalities. 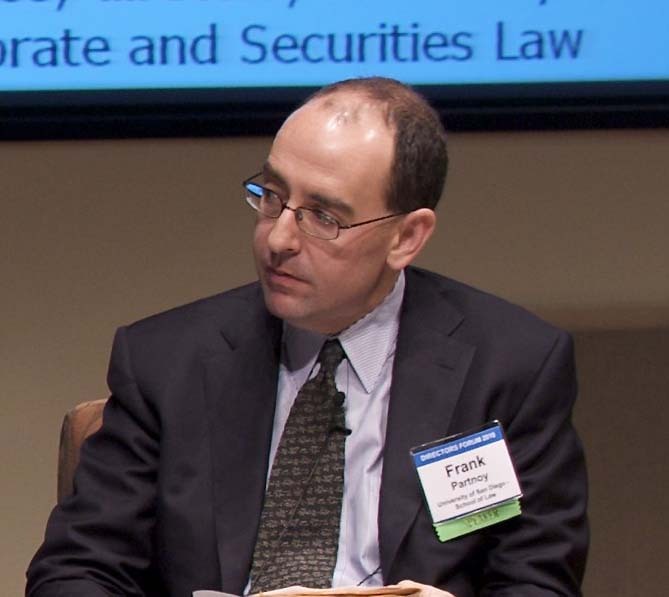 Session 1: “What to Expect in Regulation,” presented by Frank Partnoy, director of USD’s Center for Corporate and Securities Law. The sun was shining outside our beautiful auditorium at the University of San Diego but Professor Partnoy’s prognostications inside the hall were gloomy with his comparisons of the current financial crisis and the Great Depression. “This is 1931,” he said, noting that markets recovered from the 1929 crash but then turned down again. Because of the recovery (like the little bear market in 1930), he doesn’t see strong demand for reform. Like then, banks say they will reform themselves. Like their Pecora Commission, our Financial Crisis Inquiry Commission is mostly political theater. Pecora didn’t even arrive at the commission remembered for him until 1933. Our efforts could be similar. If history is a guide, it will take a couple of years. Partnoy doesn’t see real reform on the horizon until more revelations of wrongdoing. He predicts the Volker rule will be watered down and sees an absence of commonsense in the process. Proxy access is coming but there are still some vestiges of a federal versus state law battle. Delaware incorporated companies may already adopt bylaws and many may do so to preempt the proposed federal default rules. (Elsewhere at the conference the advice was more to be ready, once we know what the rules will be.) Partnoy described the basic outline of the proposed default, with its thresholds ranging from 1, 3 and 5%, depending on size – the 25% limit on board members so nominated and the one year holding period. Broker nonvotes won’t count this year and that has hedge fund activists excited. They don’t care much about proxy access because the new rule can’t be used for a change in control, and that’s what hedge funds seek. Derivative and credit rating reforms may be the most important reforms on the horizon for 2010. However, strong action appears unlikely. Yes, they’ll probably pass something but there won’t be a central clearing platform for the derivatives that really matter. Banks don’t like the idea of open source disclosure of all contracts, even on a lag basis. Session 2: What to Expect in Litigation, facilitated by Fran Partnoy. 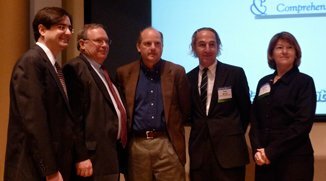 Panelists included Leo E. Strine, Jr., Vice Chancellor of the Delaware Court of Chancery; Darren J. Robbins, Coughlin Stoia Geller Rudman & Robins LLP; and Koji Fukumura, Cooley Godward Kronish LLP. Initial discussion focused around the issue of individual director liability and the fact that many funds are pushing for that. They want individual directors to feel the pain, not just be covered by D&O insurance. So far, it appears that most of the money that has come out of director pockets has come from CEOs who also chair their boards. Cases were down in 2009 because the market is up. Companies have spent up to $80 million to defend two directors. Strine offered up a bit of speculative advice. Separate director’s insurance from officer’s insurance. Officers get most of the focus, often depleting the coverage available. Options backdating and earnings smoothing created a culture of corruption that led to the move by public funds to go after individual directors. 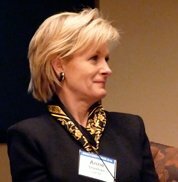 See discussion at Insurance for A-Side D&O Exposures after Enron—A Riskier Proposition?, IRMI.com and Recent Developments in D&O Insurance, HLS CG&FR Bog. There was also discussion around the fact that many disclosure only cases filed in state courts are abusive. They are filed as soon as any action happens, like an agreement to sell. Several cases discussed. Strine also cautioned to watch shortcuts regarding tax avoidance and don’t sign consents of action after the fact… like documents where management fills in the blanks later. Gimmicks are gimmicks and should be avoided. Also some discussion around a case where the company tried to sue its own internal auditors for malpractice but couldn’t. The deadline was August 17th, so the comment letters on proxy access have all been filed and posted. Many are well worth reading. If you don’t see yours posted, you might want to resubmit it. Cornish Hitchcock, writing on behalf of the LongView Funds warns against a state-law carve-out, praising the merits of a uniform system. 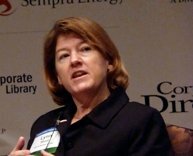 Like TIAA-CREF, the LongView Funds would like to see the required holding period extended to two years and nominations going to the largest nominator. Broadridge submitted a letter discussing various technical issues. Great for those who want to get into the weeds. Writing on behalf of Sodali, a global corporate governance consultancy, John Wilcox asks: “Is Rule 14a-11 is sufficiently deferential to the traditional role of the states in regulating corporate governance? ; and (2) Does the proposal achieve the Commission’s goal of removing burdens that the federal proxy process currently places on the ability of shareholders to exercise their basic rights to nominate and elect directors?” His analysis answers with a resounding yes. Mandating a federal standard that take precedence over state laws. 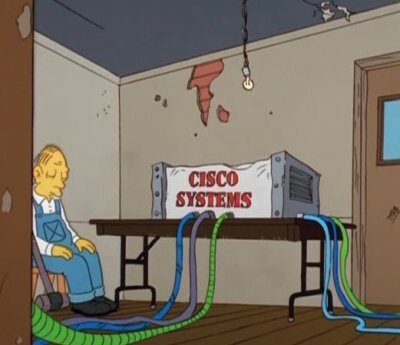 Placing all bona fide candidates on a single management distributed proxy card. reimburse expenses shareowners incur in conducting a proxy contest, since this will only escalate costs paid by shareowners. Increase candidate statements to 750 words and specified space for graphics that can address any issue related to the election, including short-comings of the current board. Measures to ensure board members nominated by shareowners are not marginalized. Amendments to Rule 14a-8 also clarify that shareowner resolutions can seek to collectively hire a proxy advisor, paid by for with company funds, that isn’t precluded from offering advice on board elections. Require that companies must allow shareowner resolutions to be presented during the business portion of the annual meeting. An override mechanism on Rule 14a-8(i)(5) (Relevance) and (i)(7) (Management Functions). Dozens of studies in communications and organizational behavior find current corporate structures to be inefficient. Most decision-making structures, including those now governing corporations, are designed around status needs related to dominance and control over others. They are not designed to maximize the creation of wealth for shareowners or for society at large. In order to gain higher status, individuals seek to dominate more and more people. This dynamic moves the locus of control inappropriately upward. In order to generate more wealth, we need to take advantage of all the brains in our companies, as well those of concerned shareowners. We can do so by making corporations more democratic, top to bottom. Now, we eagerly await the Commission’s action. If they are slow in finalizing the proposed rules, I hope it is because they carefully read our letters and are rewording them to require more, not less, democracy. Corpocracy by Robert A.G. Monks (Wiley Publishers) summarizes its main theme on the book’s cover-“How CEOs and the Business Roundtable Hijacked the World’s Greatest Wealth Machine-and How to Get it Back.” Corporate lawyer, venture capitalist and bold shareholder activist, Monks gives us his inside knowledge about how corporations seized control from any adequate government regulations and especially from their owners, their shareholders, and institutional shareholders like mutual funds and pension trusts. This is a very readable journey through the pits and peaks of corporate greed and power that shows the light at the end of the tunnel. 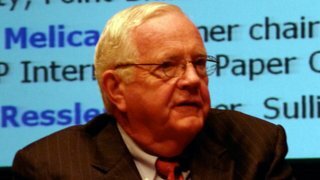 Robert Monks is a true visionary, and this assessment of corporate control of every institution set up to provide oversight or assure accountability will provoke a series of “aha” moments from anyone who has wondered why we permit corporations to determine everything from pollution levels to the outcome of elections. With mastery of the languages of finance, economics, business, politics, culture, and values (in all senses of the word), Monks ties together the Babel of vocabularies with analysis that is utterly clear-eyed and recommendations that are creative but utterly rational. The balance of power between boards and CEOs in the United States remains a paradox, given the country’s regulatory history of preventing accretions of power in relation to trusts and to banking. Nowhere else would it be possible to elect a director on a single vote, nowhere else could shareholder votes be invalidated by “ballot stuffing”, nowhere else are shareholders so limited in their ability to raise issues at AGMs, which some directors may not even bother to attend. The prevailing concept of CEO/chairmen selecting their outside board members, thus compromising their independence, strengthens the hand of the CEO at the expense of that of the board. In spite of setbacks, he believes that this essential accountability can be restored. He sees no cause for new laws, agencies or fiscal measures, though the existing statutory and regulatory framework should be effectively enforced. 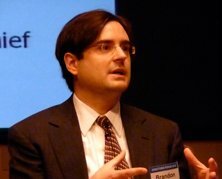 He argues that it is the major investing institutions that carry the obligation to themselves and to society to restore trust in the capitalistic system… The obligation, however, of the great foundations, among the investing institutions, to play their part in bringing about reform goes beyond the calculus of financial gain. It lies at the heart of their creation. They directly assist their chosen causes, but that is within the wider context of a market system which provides them with the ability to do this. They have a responsibility to maintain the means by which they fulfil the aims for which they were founded. I was lucky enough to get a pre-print, which I read in a couple of sittings within a few days of its arrival. Corpocracy: How CEOs and the Business Roundtable Hijacked the World’s Greatest Wealth Machine — And How to Get It Back both delights and informs in a way only Bob Monks can, because he has been at the center of so many of the important battles to make corporations more accountable. His lifework has been delineating the underlying dynamics of corporate power to devise a system that combines wealth creation with societal interest. No one else can write as well about “How CEOs and the Business Roundtable Hijacked the World’s Greatest Wealth Machine” because no one else has been as engaged as Bob Monks from so many angles. Monks appears to be a believer in the forces of markets but regulated to ensure a level playing field. Without that, the overall effect has been to turn the stock market into “a gigantic, round-the-clock casino that runs the biggest game the world has ever seen.” Market values and goals have become national goals. Corpocracy is another top-notch effort from the individual who continues to have greater lasting impact on the field than anyone else. Still, I would have placed a different emphasis in the “How to Get it Back” portion of the book.. When Les Greenberg, of the Committee of Concerned Shareholders, and I started preparing our petition on proxy access in July of 2002, I remember e-mailing Bob, asking if he would sign on with us. It was late in the week when Bob e-mailed back that he had a meeting scheduled with then SEC chairman Harvey Pitt on Monday. If we could get him the proposal over the weekend, he might be able to discuss it at his meeting. We did. 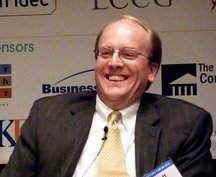 My impression is that Bob’s primary focus was on Pitt’s 2/12/02 response to a letter Ram Trust Services had sent 13 years earlier where Pitt clarified the SEC’s stance that proxy voting is in fact an investment adviser’s fiduciary responsibility, generally governed by state law. I think Monks was asking Pitt for regulations to enforce that duty through required disclosures. Pitt was apparently won over by Monks, Amy Domini, and others. My little story has two points. First, most of us don’t routinely meet with SEC chairmen. Bob’s history of involvement in corporate governance has been as one member of the elite meeting with other members of the elite. Like the fictional character, Forrest Gump, Monks met with many historical figures and has influenced important development. Unlike Gump, Monks has done so with candid intelligence and a deep awareness of the significance of his actions. Second, like the earlier Avon letter, the Ram Trust letter and follow-up eventually led to regulations. Monks may espouse “no new laws or regulations are needed” but several of his most important actions have led down that path. Perhaps Monks is correct, as Cadbury points out in his review, that foundations have a special obligation to reform the market system which sustains their existence. That’s where Monks places much of his emphasis in the “How to Get it Back” portion of the book. In his flights of fantasy, Bob dreams of a president who will use his/her powers to end conflicts of interest and compel good governance in contractors. “The framework is in place. The laws exist,” he insists. Yet, two pages later he notes the need for legal changes. He reminds us the First Amendment “was not meant to protect the Church from government intrusion, but rather to protect the government… We need similar protection today from the dominant institution of our own time, the corporation.” He defines corpocracy as “government by the corporations; that form of government in which the sovereign power resides in corporations, and is exercised either directly by them or by elected and appointed officials acting on their behalf.” I can’t help but believe that the tide won’t turn until the rabble of individual investors demands change. Individual investors have a vote in electing government representatives — the sovereign power; institutional investors don’t. Lucian Bebchuk and Zvika Neeman, in a recent paper entitled Investor Protection and Interest Group Politics, also proceed on the assumption “that individual investors, who invest in publicly traded firms either directly or indirectly through institutional investors, are too dispersed to become part of an effective organized interest group with respect to investor protection.” Yet, their own model contains the following hypotheses. Therefore, educated individual investors are critical if we have any hope of electing public officials who will protect politics from corporate influence and who will revise the legal framework so that it better combines wealth creation with societal interest. 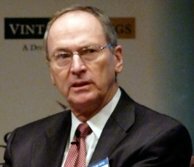 Roger Headrick’s “win” last year at CVS/Caremark, based on a margin decided by broker votes, lead to additional calls for the SEC to approve NYSE’s proposal to bar brokers from casting uninstructed investor votes in board elections. Drawing from the other six, this may be the easiest to implement with a relatively large possible impact. That’s why I’m working on it. We need system(s) or perhaps just instructions, so that lazy but somewhat conscientious shareowners can assign their votes to others based on reputation, rather than tossing their proxies in the shredder. I surveyed brokers and determined that making such assignments will not be a problem at most. Now I simply need to find an institution or two willing to take the proxies. Of course there are lots of technical and legal details but they don’t appear insurmountable. Before each voting deadline, we find out how respected institutional investors with a variety of voting philosophies have chosen to vote their shares. We’ll help you figure out which funds have similar voting philosophies to yours. When a fund you agree with makes a decision on a stock you own, we’ll send you a free alert. You’ll have a week or two to look at their decisions and cast your own ballot. The system appears to depend on funds posting how they voted or intend to vote prior to the shareholder’s meeting…with Andy’s software crawling the internet to gather the information. This may work well in high profile cases. However, we’ll need more institutions to routinely post votes in advance. The Times goes on to discuss the costs of such activist campaigns that appeal to shareholders through newspaper ads. 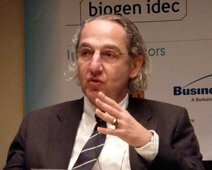 Antonio Borges, chairman of the European Corporate Governance Institute and a vice chairman at Goldman Sachs in London, says sacrifices for short-term gain would remain exceptions because short-term investors could only sell their shares at a profit if they find new investors who believe in the long-term potential of the revamped company. In reading the article, what struck me is the growing assemblage of activist funds and shareholder associations in Europe. Where is the US equivalent of the VEB (Vereniging van Effectenbezitters or Dutch Investors’ Association) or the UK Shareholders’ Association? In the US, BetterInvesting is the largest nonprofit organization dedicated to investment education. Although their goals include helping their members to “learn, share, grow and more fully experience the rewards of investing success,” I find no mention on their site equivalent to the UK Shareholders’ Association’s vow to “protect your rights as a shareholder in public companies and promote improved standards of corporate governance.” It might make for more interesting investment clubs in the US if members acted as owners, instead of just stock pickers at the casino. The US hasn’t had an effective advocate for retail shareholders since United Shareholders Association. Deon Strickland , Kenneth Wiles and Marc Zenner documented that USA’s 53 negotiated agreements are associated with a mean abnormal return of 0.9 percent, a $54 million shareholder wealth gain. 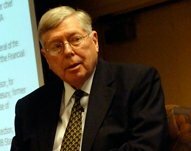 Although Peter Kinder, President, KLD Research & Analytics, Inc., tells me USA “was a significant factor in turning ‘good governance’ into a checklist of factors that made easy or easier ‘maximizing shareholder value’, i.e., flipping or extorting the corporation” — something we obviously have to guard against in any new iteration. I’ve repeatedly contacted the National Association of Investors Corporation (NAIC) but they do not appear interested in governance issues. As I recall, USA was originally funded by a shareholder’s lawsuit. Maybe we need another. 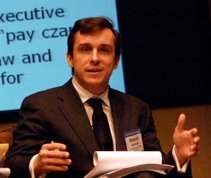 Richard Macary’s AVI Shareholder Advocacy Trust presents an innovative mechanism to combine small shareowners to advocate changes in corporate governance. The Trust sets out its goals, makes its case to shareholders, and then is dependent on contributions. The Trust depends on a monitoring/activist agent who is so compelling that shareholders freely pony up contributions to support work that might pay off. Free rider issues abound. The Trust is not a “for profit” vehicle nor can any contributor expect to get any kind of return on their contribution. In a way, it’s similar to contributing to a campaign or political action committee where you agree with their platform or want to see a specific candidate elected, so you contribute. Your only upside in that scenario is that if your candidate wins, you believe it will be good for you or your position, be it lower taxes, a cleaner environment, less regulation, etc. The trust is also set up to compensate the managing trustee, who is essentially the coordinator, director and general contractor of the effort. The trustee is very much like a general contractor in that he, she or they will essentially hire and direct all of the professional and advisors needed to execute upon the trust’s goals. Because of the expense and free rider issues, the only reason most institutions vote are the federal regulations Bob Monks helped to create that require pension and mutual funds to vote stock in their beneficiaries’ interests. 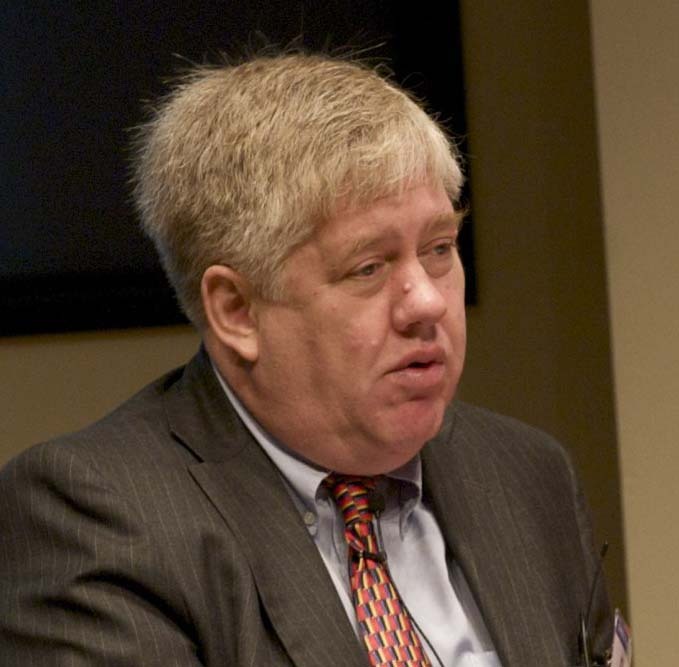 Of course another of Bob’s important contributions was founding Institutional Shareholder Services, increasing the research done on proxy issues and its availability. The biggest obstacle to voting now is not the time it takes to vote but the research needed to make an informed vote. Most people realize that just going along with the board of directors for lack of an easy alternative is not a meaningful vote. But understanding the proxy issues requires too much time and expertise, especially for individuals. 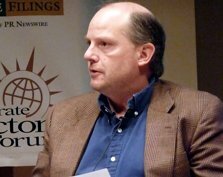 On that front, the Corporate Monitoring Project and VoterMedia.org, both initiated by Mark Latham, have shown the way to empower voters with better information. Latham’s system allows shareholders to allocate collective corporate funds to hire a monitoring firm to advise them on the issues and how to vote. 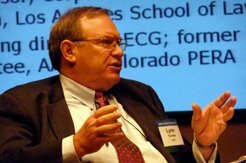 Latham’s system would eliminated free rider issues and creates an incentive to pay for much more research. 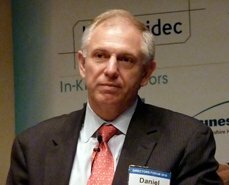 “Comprehensive analyses of proxy issues and complete vote recommendations for more than 10,000 U.S. companies are delivered by ISS’s seasoned U.S. research team consisting of more than 20 analysts.” We can thus estimate about four hours of analysis per proxy, costing perhaps $2000 including ISS infrastructure costs. Considering the amount of money we shareowners pay CEOs and boards of directors who are elected and compensated based on our voting, and the amount of capital at stake in the typical company they manage for us, we should be spending more than $2000 to guide our voting. Mark proposes use of shareowner resolutions to choose an advisor from among competitors. Any proxy advisor could offer its services, specify its fee, and have its name and fee appear in the ballot. The winner would give proxy advice to all shareowners in that company for the coming year. The advice would be published on a website and in the next year’s proxy. The company would pay the specified fee to that advisor. The voting could even be designed to hire more than one advisor, with a separate yes/no vote on each candidate. 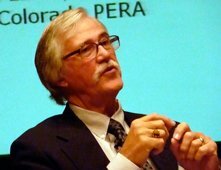 Advisor name brand reputation can make these voting decisions feasible without another level of paid voting advice. (see Proxy Voting Brand Competition, Journal of Investment Management, Vol. 5, No. 1, (2007). This is more of a technical fix, rather than a monumental reform that will bring in more individual investors but I thought I’d just stick it in here at the end of “how to’s” Bob might have discussed. Yair Listokin’s Management Always Wins the Close Ones highlights the need for open ballot counting. Informational asymmetries between management and potential opponents should be mitigated by allowing anyone to obtain a real-time update of the voting. The status quo allows management to obtain frequent vote updates, while shareholder opponents of management often have no comparable knowledge. 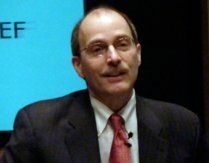 This allows management to win votes when underlying shareholder preferences are against a proposal because management can tailor its expenditures as needed; if management sees that it is well behind, it can undertake an extraordinary effort, while its opponents have no obvious way of responding. If all parties had the same knowledge about the likely outcome of the vote, then managerial opponents could respond and potentially neutralize management’s efforts to push the vote in a particular direction. Obviously, anything we can do to make corporate elections less rigged will also help to bring shareowners out to vote. Why bother if the fix is in? My hope is that once shareowners get used to voting in their best interests in corporate elections, that behavior will also carry over to civic elections. Activists in either social institution will likely carry over to the other.